KUALA LUMPUR/SINGAPORE, June 15 (Reuters) – A small oil tanker was hijacked off the southeast coast of Malaysia over the weekend in the second such incident in the same area this month, raising further concerns over piracy in Southeast Asia, maritime officials said on Monday. The Malaysian Maritime Enforcement Agency (MMEA) said the 7,300 deadweight tonne (DWT) Orkim Harmony disappeared about 30 nautical miles from the Johor port of Tanjung Sedili, carrying around 50,000 barrels of RON95 gasoline. 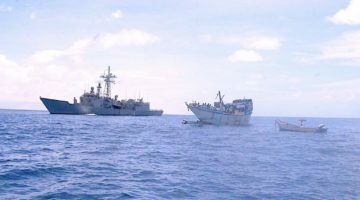 “This is a confirmed case of piracy,” said Vice Admiral Ahmad Puzi Ab Kahar, deputy director general of the operations unit of the Malaysian Maritime Enforcement Agency (MMEA). Maritime authorities in all Southeast Asian countries have been contacted to help search for the missing ship, he said. Traders said the hijacked vessel was small compared with the 300,000 DWT of a standard super-tanker, and the missing fuel volume was not enough to impact markets. The Orkim Harmony is operated by Malaysia’s Orkim Ship Management, which said the vessel was on the way to Kuantan port on the east coast of Peninsular Malaysia from Malacca. The crew of 22 consists of 16 Malaysians, five Indonesians and one Myanmar national, Orkim said. Ahmad Puzi criticized the shipowner for waiting too long before contacting authorities. “Orkim only alerted authorities 10 hours after they lost contact with Orkim Harmony … The lapse after they lost communication made it very difficult for us,” he said. The vessel issued no distress call and all communications and tracking systems have been turned off, he said. The vessel’s last known position was southwest of Pulau Aur, Mersing in Malaysian waters, the shipowner said. Islands in the area are popular with tourists for their beaches and diving. The MMEA said the gasoline on the ship was owned by state-controlled oil and gas company Petronas. Earlier this month, the 7,100 DWT oil tanker Orkim Victory carrying diesel loaded from Petronas was hijacked on June 4 in the same area and on the same route. “The perpetrators were armed with two hand guns and one machete … They threatened the crew and reportedly assaulted them, though no injuries were reported,” a ReCAAP report said. “The perpetrators subsequently brought Orkim Victory to another location … and siphoned off 770 metric tonnes (about 6,000 barrels) of automotive diesel oil,” it said. The Orkim Victory has since been released and shipping data on the Thomson Reuters terminal shows it currently heading into Sandakan port in the Malaysian portion of the island of Borneo. Vice Admiral Ahmad Puzi said it would be more difficult for the hijackers to siphon off the gasoline from the Harmony than it was to steal diesel from the Victory. “In the earlier Orkim Victory case, the pirates siphoned the diesel via ship-to-ship transfer … The RON 95 will be more difficult to transfer as it is highly flammable,” he said. “It needs special safety requirements and equipment. We believe they (pirates) are looking for facilities to transfer the petrol to their ‘customers’ … The closest registered facilities are in Thailand, Brunei, Vietnam,” he said.